The classic and beloved Buffalo Nickel was minted from 1913-1938. It celebrates the culture and heritage of the American West, and the designs are recognized as some of the most beautiful and artistic ever to appear on a coin. The last coin was minted over 75 years ago in 1938. 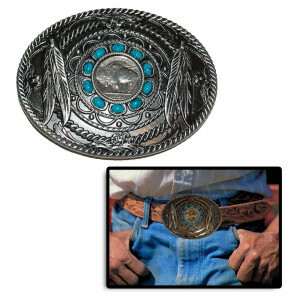 This Native American-inspired belt buckle features a genuine Buffalo Nickel. The buckle displays Western and Native American designs, including rope designs, feathers, and a ring of faux turquoise around the Buffalo Nickel in the center of the buckle. 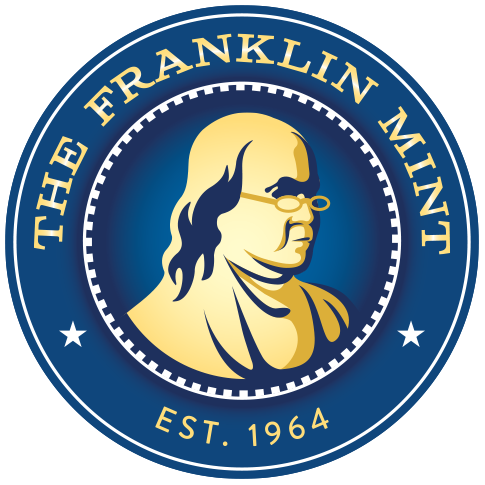 The coin was designed by famous sculptor James Earle Fraser, who was known for his dramatic images of the American West. The beautiful and artistic design makes this the quintessential “American” coin and a unique celebration of “Wild West” culture and heritage. The obverse is a composite portrait of three Native American chiefs: Iron Tail (a Sioux who fought against Custer at Little Bighorn and who was a star in Buffalo Bill’s Wild West show), Two Moons (a Cheyenne who also fought at Little Bighorn), and movie star John Big Tree (a Seneca). All three were alive when the coin was first issued. The reverse features a stunning image of a buffalo, Black Diamond, who was a star attraction at the New York Zoological Gardens. The buffalo was a symbol of the American West, but it was almost extinct when the first Buffalo Nickel was made in 1913. Black Diamond was also alive when the Buffalo Nickel was first minted. Most Buffalo Nickels were worn or damaged in circulation or were destroyed by the U.S. government when the Jefferson Nickel was introduced in 1938, leaving few for today’s collectors.